Tuxedo Chamber of Commerce: Tuxedo Farmer’s Market - 9 AM to 2 PM This Saturday! Tuxedo Farmer’s Market - 9 AM to 2 PM This Saturday! Come support our vendors who bring the finest quality and locally produced goods to our market. You'll feel good about being part of something bigger. Help keep open farm land present in Orange County by shopping at our market. Knowing where your food comes from is very important. Get to know the vendors and learn how they grow, harvest, raise or make the products they bring to our market. You are part of the local economy, so you understand how important it is to keep this town vibrant and moving forward. We're doing that, too! Tuxedo Farmers' Market is looking for non profit organizations, Girl Scouts, Boy Scouts and local music and dance studios, Fitness Instructors/yoga teachers, art teachers, local teams (Cheering, Rowing, Baseball - anything goes) local camp groups...etc to come to our market to promote your business and or raise money for your teams. We would love to have you at our market. 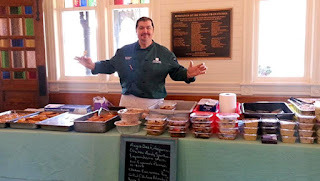 Just email: christina@tuxedofarmersmarket.com so we can get you on the schedule and calendar of events.